Religions Minister Ben Dahan plans to visit desecrated synagogues in southern Israel. Deputy Religions Minister, Rabbi Eliyahu Ben Dahan (Bayit Yehudi), reacted Sunday to the desecration of two synagogues in the community of Ezer, in the Lachish region in southern Israel. Ben Dahan added that he does not believe that Jews are capable of vandalizing a synagogue, or items that are sacred to the Jewish nation. He also hinted strongly at hypocrisy on the part of personages like the president, the prime minister and the chief rabbis, who were very quick to react vehemently when a mosque was thought to have been desecrated by Jews – even though it turned out afterward that the vandalism was probably carried out by Muslim Arabs. A volunteer arrived Friday at a synagogue in Ezer, located near the coast between Ashdod and Ashkelon, to find the house of worship broken into. 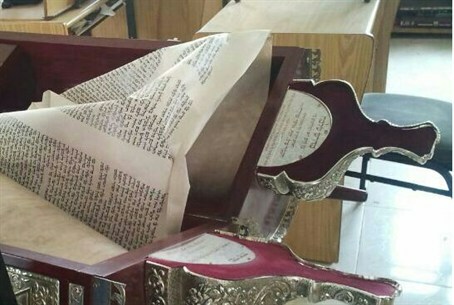 Vandals had broken the Torah ark door off its hinges and torn Torah scrolls which were found thrown on the floor. The vandals also damaged other holy items, leaving them scattered on the floor as well. Similar vandalism was found in an adjacent synagogue, where Torah scrolls and objects were likewise damaged and discarded.